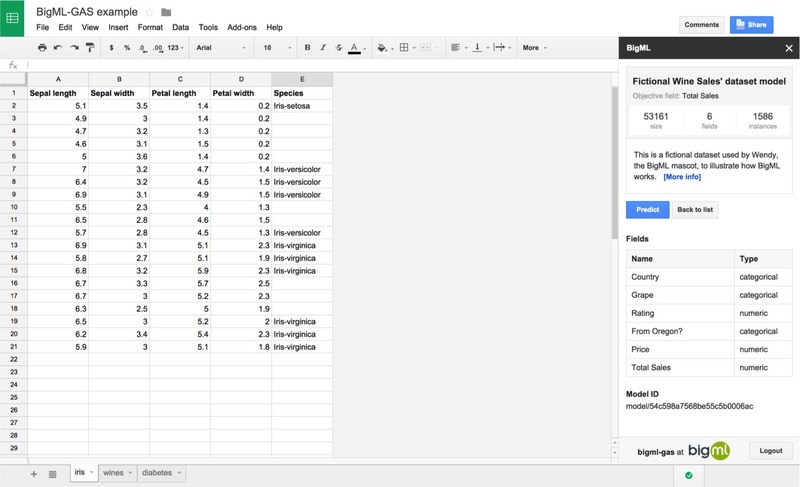 Machine Learning now in Google Sheets! 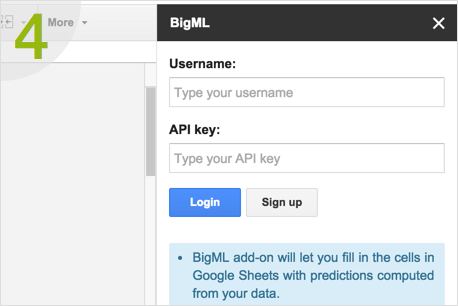 The BigML add-on brings the power of the Machine Learning models and clusters in BigML to your Google Spreadsheets. The add-on provides an easy access to the models and clusters under your account in BigML within the Google Sheet. Using them, the blank cells in your datasheet can be filled with the predictions that the model can extract from the known values in each data row. 1 After installing the add-on, select BigML from the add-ons drop down menu and navigate to Start. 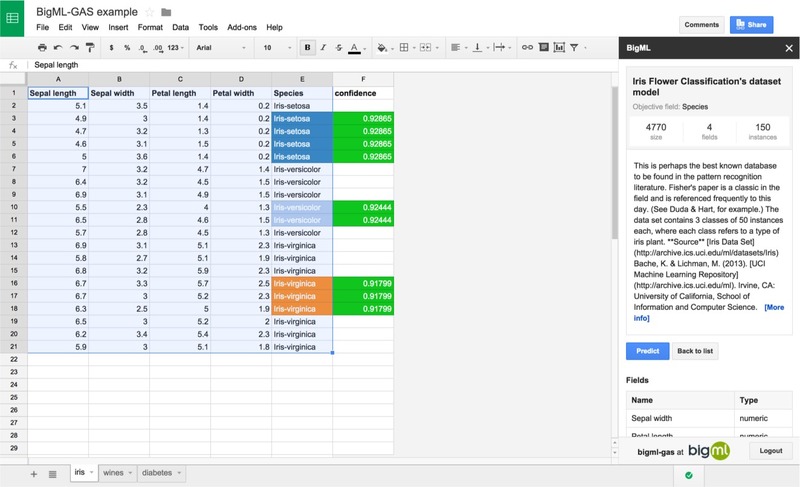 A side bar will appear on the right of your Google Sheet. 2 You need registration in BigML to use this service. 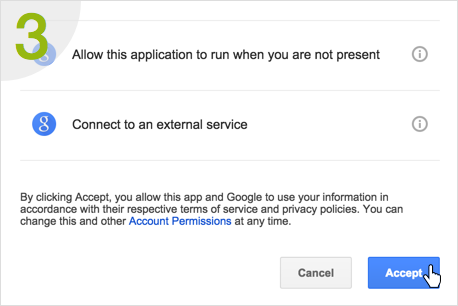 Use the Sign up button to create your credentials in BigML and/or introduce them for authentication. The credentials will be stored in your user preferences and used from then on. You can manage your credentials in https://bigml.com/account/apikey. 3 Browse or search the models and clusters available in your BigML account. For first time users: As a first time user, you will see no models in your account, but they can easily be created from any CSV local or remote file. To learn more about uploading your data to BigML you can check the video here. 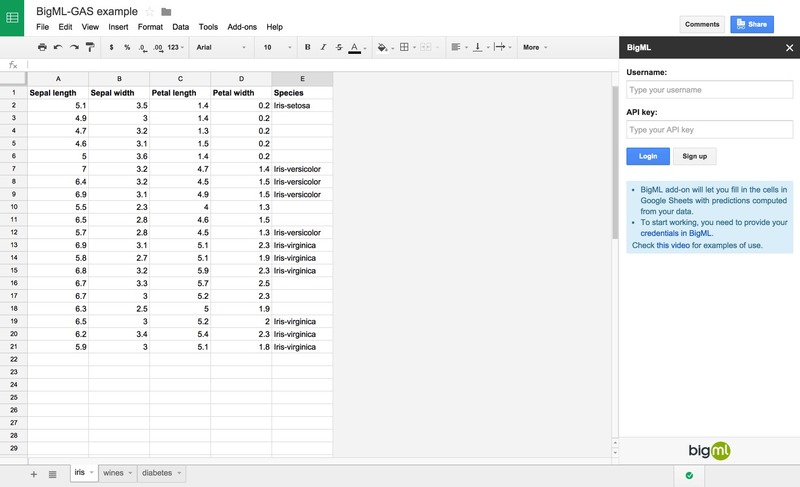 You can also upload the data in your public Google Sheets. 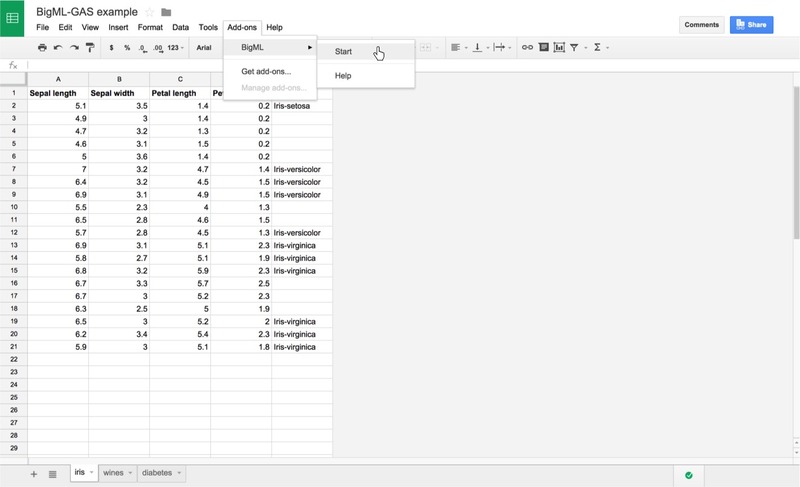 Copy the URL of your Google Sheet, remove the text after the last slash and add "export?format=csv" to get the contents of the Sheet in CSV format. 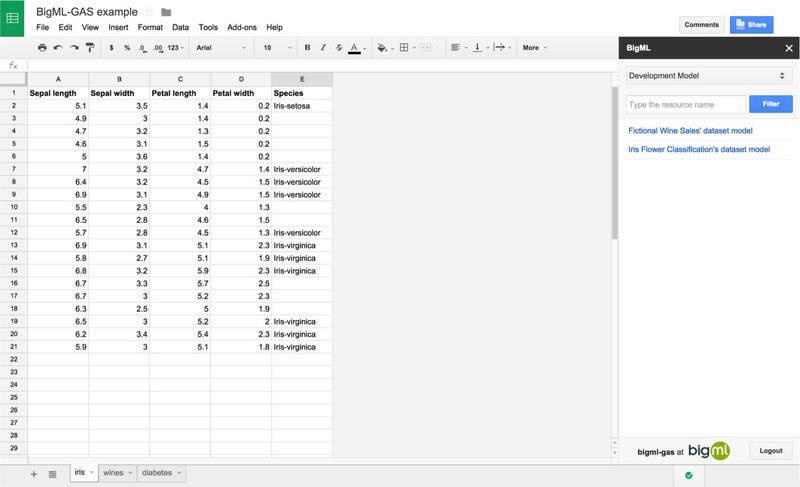 This URL can be pasted in the remote URL form and the data in your Google Sheet will be uploaded to BigML. The next step is generating a dataset from your source and finally generating a model (or cluster) from your dataset. 4 Use your models (or clusters) to fill the empty cells of a column with predictions. Each column can be predicted using the values of the rest of columns in your data plus a model previously built from fully populated data. Select the model that best predicts the column of data that you want to autofill (it can be previously built with historical data or purchased from our gallery of models). 5 Select the range of rows that you would like to use in the prediction and click the Predict button to see the predictions appear. Note that the columns in your selection are expected to match the fields in the model (listed in the model description on your side bar). 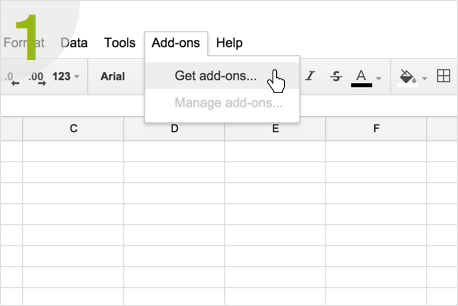 Select "Add-ons" > "Get Add-ons..."
Find BigML in the Google Sheets Add-on Store. Then click the "+Free" button to install. 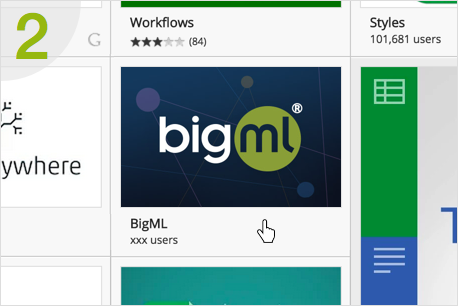 Sign in with your BigML credentials to get started!